For sale is a Traditional Scale New In Box Breyer Hickory Hills Wall Street 1761. 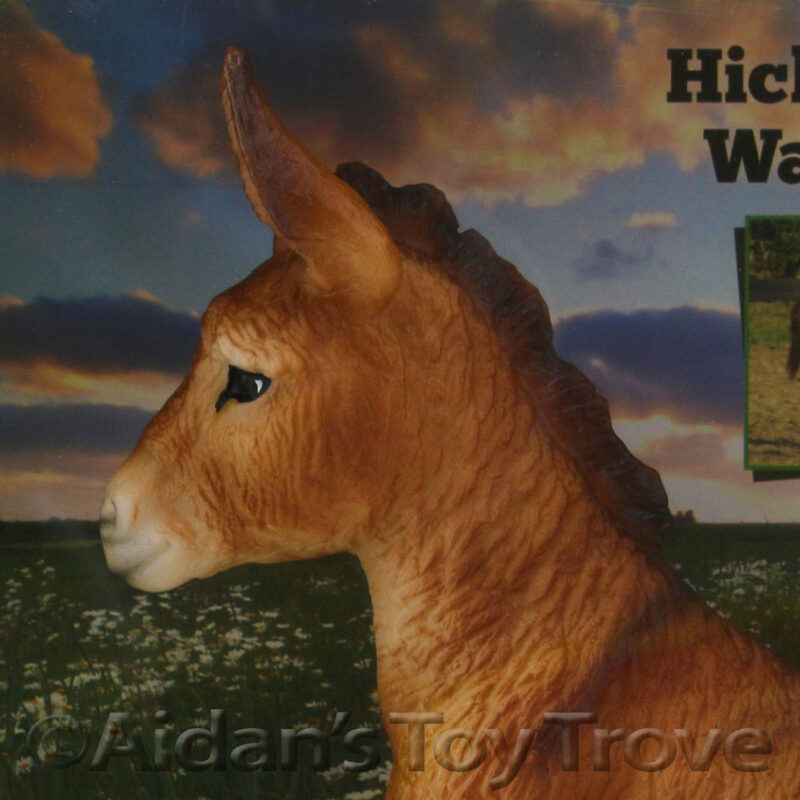 He is the Brighty donkey mold in a pretty light brown or dun. The Brighty mold measures approximately 7″ tall x 6″ long. He was made in the image of the real Miniature Donkey, Hickory Hills Wall Street. This show-stopping 2013 Miniature Donkey jack (male) stands 30 1/2″ tall, with a beautiful red coat with garters (striping) on all four legs and a cross on his back. Known as “Wally” to his friends, he got his unique registered name as a nod to his sire’s own stock market-inspired moniker, Hickory Hills Dow Jones. Owned by his breeders Harvey and JoAnn Jordan of Hickory Hill Donkey Farm, Wally competes in halter classes. Only 2-years-old, he has earned five First Place finishes, three Grand Champion titles, a Best of Breed title and Grand Champion Donkey at the Houston Livestock Show & Rodeo in 2015! Hickory Hills Wall Street is still sealed and tied in the original box. The box may have normal wear. I noted no flaws on the horse. I cannot guarantee the condition of the boxed side. Please note that I have multiples of this model. You may not receive the exact horse pictured. 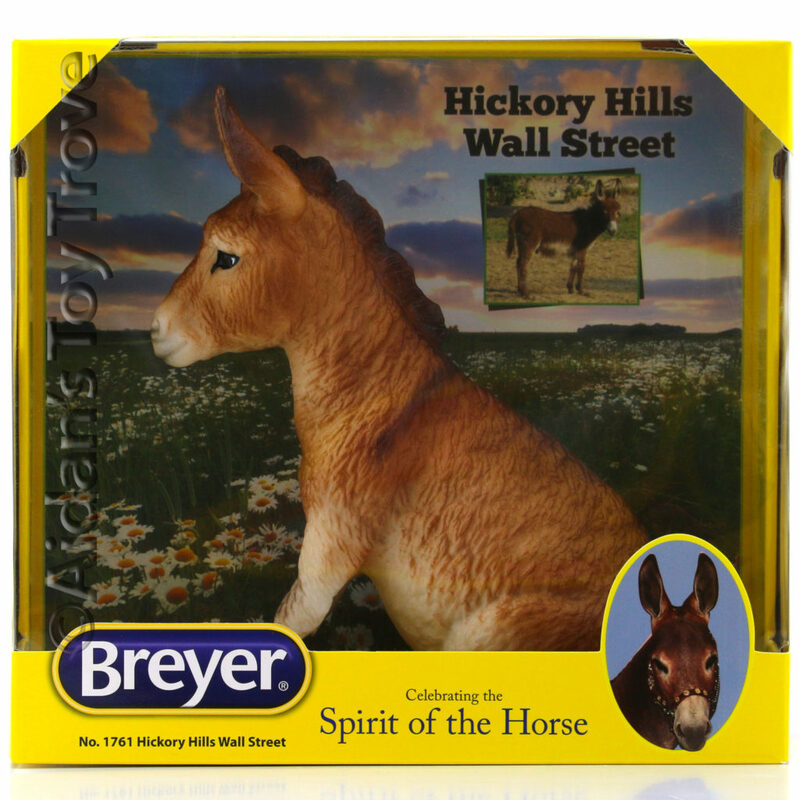 You will receive a brand new in box Breyer Hickory Hills Wall Street 1761.